I love cream puffs. I love how each small, crisp, hollow round of choux pastry is split in half, filled with loads of sweet whipped cream, and then dusted with a thick coating of powdered sugar. Some say the choux pastry shells look like small cabbages which is probably where the name "choux" comes from, as "choux" in French means "cabbage". Catherine de Medici's (an Italian who married France's Henry II) pastry chef is credited with inventing choux pastry in the 1540s and it has been the springboard for many desserts ever since. Besides cream puffs, two other desserts using choux pastry are eclairs (long finger-shaped choux pastry filled with cream and glazed with chocolate) and Profiteroles (small puffs of choux pastry split and filled with cream or ice cream and topped with chocolate sauce). 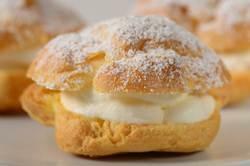 Cream Puffs begin with a baked shell of choux pastry. Choux pastry or pate choux is an unusual pastry in that it is first cooked on the stove and then baked in the oven. It is made by adding flour to a boiled mixture of butter and water (like a roux). It is important that the butter melts before the water boils as you do not want too much evaporation as this will change the consistency of the dough. Once the flour is added the mixture is cooked just until it forms a smooth ball of dough. After removing from the heat, the dough is cooled to lukewarm, and then you slowly add beaten egg until you have a smooth thick paste-like dough. (As you add the egg, you will notice that the dough first breaks apart but as you continue to beat it will come back together.) Next, either pipe or spoon small mounds of the dough on a parchment-lined or greased baking sheet. The pastry is first baked at a high temperature and then the oven temperature is lowered. The high temperature is needed so the dough will rise quickly (leaving a hollow center) and to set the structure of the shells. The temperature is then reduced to allow the outsides of the shells to become firm and crisp, while at the same time allowing the insides of the shells to dry out. You might want to cut one of the shells in half at the end of baking to make sure they have dried out, because if the inside dough is still very wet (a little wet dough is fine), the choux pastry will deflate upon cooling. Once baked, turn off the oven, and then poke a couple of holes into each puff and let them completely cool in the oven, with the door slightly ajar. Again, don't worry if the shells have just a small amount of moist dough inside as this can simply be removed before filling the shells. Once the pastry shells have cooled, split them in half and fill with sweet whipped cream. During berry season I often add a few raspberries or cut up strawberries to the cream. The finishing touch is to dust the tops of the pastry shells with powdered (confectioners or icing) sugar. In order to keep the shells crisp, fill with the cream shortly before serving. If you don't mind the shells becoming a little soft (as I prefer) you can assemble the cream puffs a few hours before serving. Just make sure you cover and place in the refrigerator. Place the butter and water in a heavy saucepan over medium high heat and bring to a boil. (Make sure that the butter melts before the water boils to reduce the amount of evaporation.) Remove from heat and, with a wooden spoon, add the flour mixture, all at once, and stir until combined. Return saucepan to the heat and stir constantly until the dough comes away from the sides of the pan and forms a thick smooth ball (about 1-2 minutes). Transfer the dough to your electric mixer, or use a hand mixer, and beat on low speed to release the steam from the dough (about a minute). Once the dough is lukewarm start adding the lightly beaten eggs (dough will separate and then come together) and continue to mix until you have a smooth thick paste (dough will fall from a spoon in a thick ribbon). Spoon or pipe 12 small mounds of dough onto the baking sheet, spacing about 2 inches (5 cm) apart. With a pastry brush, gently brush the tops of the dough with a lightly beaten egg.